Ballistic Shield (IIIA) "First Responder" » Protective Solutions, Inc. The First Responder NIJ Level IIIA Ballistic Shield was created to provide the everyday patrol officer with supplemental ballistic protection for the head and upper body beyond the typical ballistic vest. The rugged and ambidextrous tactical handle system allows for easy maneuverability. The custom design fully encapsulates the aramid core for extreme ruggedness and durability. 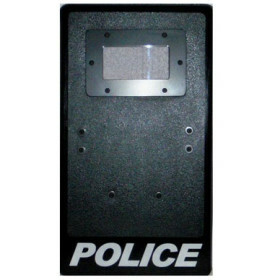 This shield is affordable and provides extreme ballistic protection. Dimensions - 17" x 29"